This is 18-year-old Reba Sikder in the jacket that my 12-year old grew out of two years ago. Thanks to the successive snow storms that hit Washington, D.C., we were lucky to have Reba stay with us for almost a week. We had the joy of introducing her to snow and sledding and hot chocolate. And now, unlike the snow that finally melted, we miss having Reba with us. Actually, we missed Reba the moment she was gone. Reba was here with one of International Labor Rights Forum’s longtime partners and one of my kids’ favorite house guests, Kalpona Akter, the head of the Bangladesh Center for Worker Solidarity. The two were in the United States on a worker tour organized by United Students Against Sweatshops to call on companies that make collegiate apparel to join the Accord on Fire and Building Safety in Bangladesh. After the horrendous garment-industry tragedies in Bangladesh last year, the accord represents a structural advance in corporate accountability: over 150 signatory companies have made a binding commitment to a safety program that ensures workers have the right to refuse dangerous work and gives trade unions a meaningful role in the governance and implementation of the initiative. Reba is shy, but quick to smile. She is upbeat, despite having recurring nightmares and clear signs of Post-Traumatic Stress Disorder from the two days and two nights she spent trapped in the rubble of Rana Plaza. Reba is soft-spoken, but an amazingly powerful speaker. She brought her testimony to the U.S. Senate Committee on Foreign Relations hearing on “Prospects for Democratic Reconciliation and Workers’ Rights in Bangladesh” and spoke at a meeting convened by congressman George Miller on February 11. 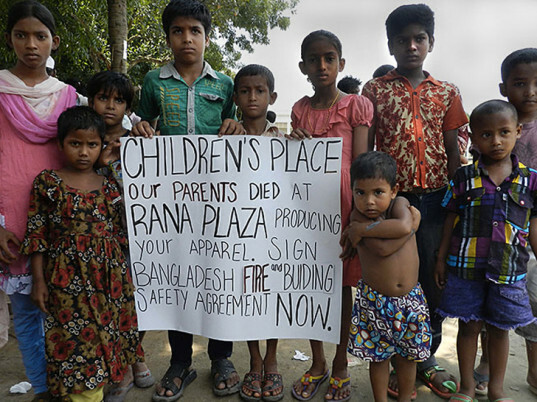 It’s hard for many of us to understand why workers went to work at Rana Plaza on April 24, 2013. Reba and her coworkers had all been evacuated the day before due to a crack in the building and some falling concrete. She said they were afraid when they reported for work the next day, but managers assured them the building was safe and insisted that orders for multinational corporations had to be filled. 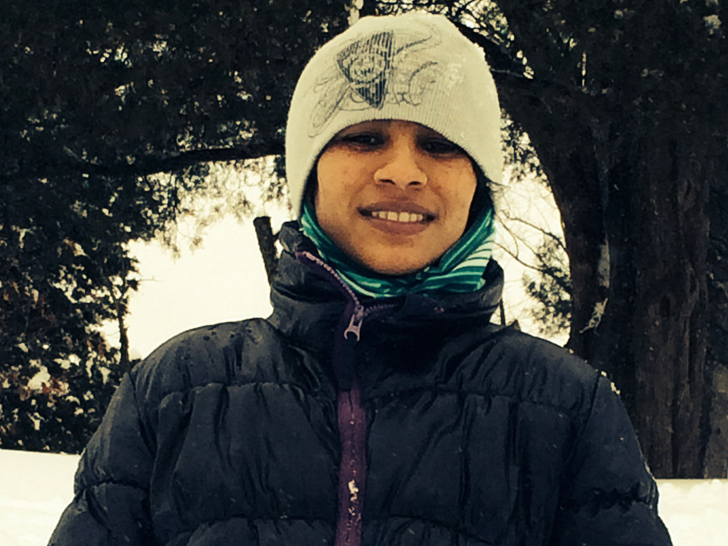 Reba moved to Dhaka at the age of 14 to start work in a garment factory. She had no one to whom she could turn. Some workers objected to entering the building but managers threatened they would lose their precious wages. The factory collapsed less than an hour after they had started working. To understand the decision these workers made, you need only imagine their backstory. In Reba’s case, she’s the youngest of five. When she was seven, Reba’s parents were too poor to keep her so they sent her to be a domestic servant. She grew up in a village far from Bangladesh’s capital of Dhaka. She moved to Dhaka at the age of 14 to start work in a garment factory. She had no one to whom she could turn. She had no access to unions or other worker-rights advocates, or any way to know what her rights were. Her existence and that of her co-workers was one of daily survival, with limited awareness of the Spectrum factory collapse that killed 64 workers in 2005 or of the ongoing scourge of factory fires. Initially, Reba was pinned under a machine and couldn’t move. She heard a coworker crying out near her. He was bleeding badly and she talked to him, telling him she was sorry she couldn’t help him because she couldn’t move. They talked to each other for a while and before he died, he passed her his cellphone. When she woke up, she saw on the cellphone that a day and a half had gone by. Now she tried again to see if she could free herself. After some time, she succeeded. Her journey out took another day and night and the tragedy she witnessed is even more unspeakable—she passed out from what she saw, woke up desperate for something to drink, and accepted a coworker’s urine. Reba passed out from what she saw, woke up desperate for something to drink, and accepted a coworker’s urine. Finally, a worker, who had no hope of escaping from where she was pinned, pointed the way out. Reba continues to have continuing pains in her ankles and back and regular nightmares, but she doesn’t complain. Since the building collapse, all she has received is the equivalent of $519 (about seven months of her previous earnings) and some classes in tailoring. The money has already gone to food and medical bills. She hopes to buy a sewing machine and move back to her home village to set up a tailor shop. Since home-based sewing is how my Italian grandmother helped keep her family afloat during the Great Depression, I gave Reba funds to buy a machine when she returns to Bangladesh. But there are thousands of others, many of whom sustained much more serious injuries than Reba and the resources committed so far are thin. 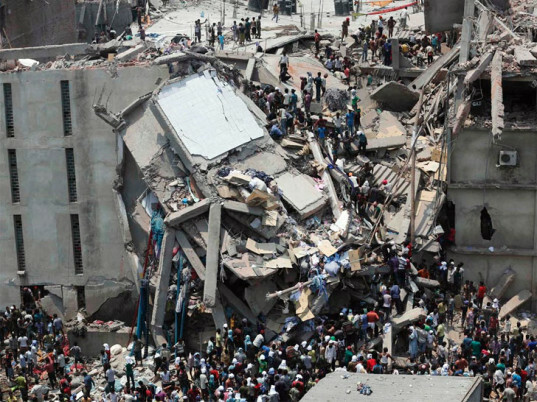 Five global clothing brands and retailers have just announced that they are the first to contribute to a new fund raising $40 million for victims of the Rana Plaza building collapse. The Children’s Place, one of the largest children’s clothing companies in the United States with over 1,123 stores, still has not contributed to the fund. The Children’s Place, one of the largest clothing companies in the United States, still has not contributed to the fund. Please show your support for Reba by sharing our petition at www.orphansplace.com and calling on The Children’s Place to do right by the injured workers and the children who were orphaned by the Rana Plaza building collapse. Until The Children’s Place pays up, Reba and the thousands of other survivors and family members will continue to wait for their full and fair compensation. 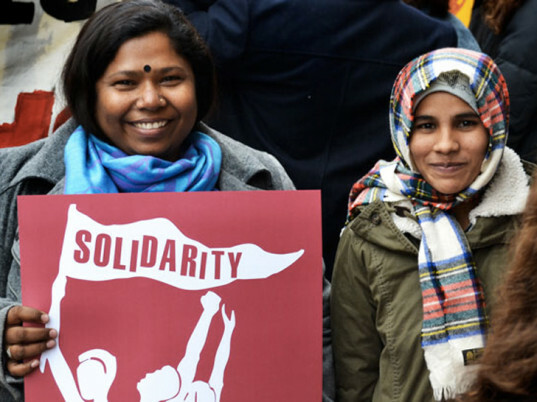 Learn more about the International Labor Forum’s campaigns, including the Global Day of Action on the anniversary of the Rana Plaza tragedy on April 24, by following it on Facebook and Twitter.